The Christmas season is definitely my favourite time of year, not least because of the presents, the food, spending time with family and the countless Christmas films, but also the fantastic smellies and pampering products that pop up when the month of December begins. The Body Shop is definitely a big player when it comes to pamper products, and at Christmas time you can always guarantee they'll have a fab new Christmassy collection released to keep us all looking and smelling fab over the festive period. 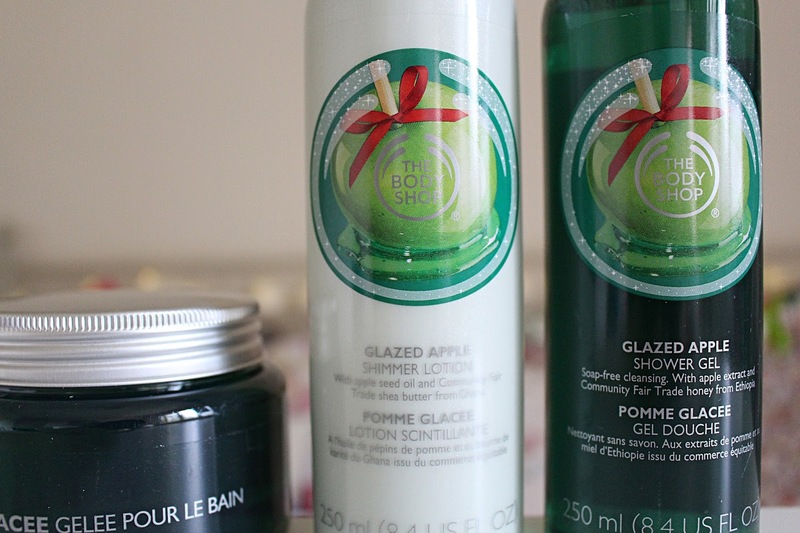 The Glazed Apple collection is a new addition The Body Shop's shelves this Christmas, and a fantastic one at that. Whilst the emerald green appearance might not be to everyone's taste, it certainly is festive and the products themselves are fantastic. I was sent a little selection of said products and thought it only right to share my thoughts with you. The entire collection smells absolutely delicious and I honestly think it's one that everyone will like - men included. It's really fresh and slightly zingy, and is a total pleasure to use. The Bath Jelly is a really odd product (I'm not very used to jelly in my beauty products!) but works amazingly well at filling the bath with bubbles and the gorgeous apple scent, whilst the Shower Gel leaves you feeling squeaky clean and smelling great. My favourite product has to be the Shimmer Lotion, however, as it combines the beautiful smell with serious moisturisation (apple seed and shea butter are just some of the ingredients) as well as leaving your skin with a beautifully seasonal shimmer - ideal for Christmas nights out. Overall I adore this collection and I'd be very shocked if there is anyone out there who doesn't like how this smells. I think any of the items I mentioned would make perfect Christmas presents, or the ideal treat for yourself! Also - if you fancy treating yourself but don't want to pay full price, use the code '14671' when you spend over £30 and get £15 off! 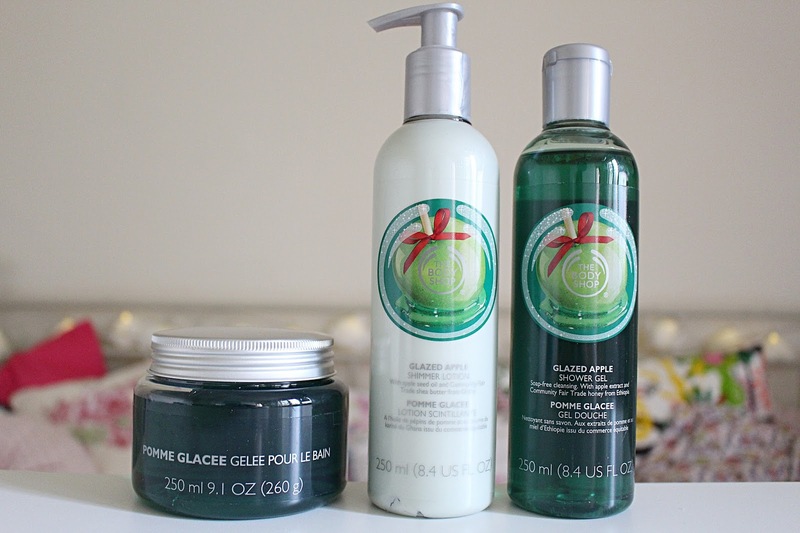 Have you tried the new Glazed Apple collection from The Body Shop? Let me know what you think to it!